An arm lift reduces and removes excess skin and fat from the upper arm while reshaping and toning for a smoother, tighter and more youthful appearance. Fluctuations in weight, aging, pregnancy and even genetics can all cause the upper arms to develop drooping, sagging skin. Brachioplasty, more commonly referred to as an arm lift or upper arm reduction, reduces and removes excess skin and fat from the upper arm while reshaping and toning for a smoother, tighter and more youthful appearance. An arm lift is a common procedure for normal weight patients who simply want to tighten their arm contours, however, the procedure is most often performed on patients who have lost a significant amount of weight. After dramatic weight loss, there is often excess fat and skin that lingers around the armpit area and sometimes extends into the chest region. An arm lift can correct this and restore proportion to the body. A thorough consultation is an important first step when deciding if an arm lift is the right option for you. One of our board certified surgeons will discuss your desired results with you and provide an honest, professional opinion on how best to achieve those results. We also make certain that you are a good candidate for the procedure, taking into account your age, health, medical background and other factors that could affect the safety and effectiveness of your surgery. All of our consultations are conducted with the goal of making sure our patients feel comfortable, confident and informed about the arm lift process. Before your procedure, your surgeon will answer any questions that may have come up since your consultation. You will also have the opportunity to meet the RTH staff assisting your surgeon during your procedure. Every effort is made to make certain that all of your concerns are addressed and you are as comfortable as possible. When it is time to begin, you will be taken to our state-of-the-art surgical suite and comfortably fall asleep under general anesthesia. Preparing you for Brachioplasty Recovery! Arm Lift Recovery – For a couple of weeks following your procedure, we recommend avoiding any strenuous activity. In just a few weeks, you will be able to resume your daily activities, but it is important to remember that everyone recovers differently, and you may need more or less time before you feel 100% again. A few days after your surgery, your RTH doctor will follow-up to see how you are healing and prescribe any necessary medication. While results vary based on the individual, most arm lift patients experience a well-contoured arm shape that is not only more comfortable, but also more youthful looking and proportionate to the rest of the body. An increase in self-confidence is also a common and pleasant side effect. During your consultation, your doctor will thoroughly explain what results to expect. Q: Is an arm lift right for me? If you struggle with loose, sagging skin under your arms, or your arms appear droopy due to excess fat and skin, an arm lift may be the right option for you. Arm lifts can be performed on both men and women in a range of ages and body weights who have excess fat and skin in their under arm areas. All arm lift candidates must be in good health and have no pre-existing medical conditions that could create complications. 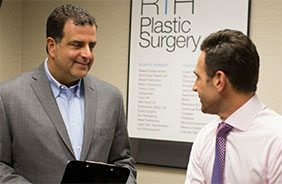 Q: Why choose RTH Plastic Surgery for my arm lift procedure? When choosing a plastic surgeon for an arm lift, there are three important qualifications to consider: training, experience and personal attention. Dr. Hajjar is Board Certified by the American Osteopathic Board of Surgery in plastic and reconstructive surgery. Above all, your doctor should be someone you trust to deliver exceptional results and perform a safe and effective procedure. Dr. Hajjar is a board certified plastic surgeon with extensive training and vast experience performing arm lift surgeries. Our surgeon spends the necessary time with every patient to answer any questions and address any concerns. We make it a priority to ensure our patients are well-informed and completely comfortable with their decisions. We know that your time is valuable, which is why we maintain an efficient procedure calendar and use the latest techniques and technology to minimize your recovery time and maximize your results. Q: Will my insurance cover my arm lift? Insurance companies commonly do not cover an elective or cosmetic surgery like an arm lift unless it is performed to correct a medical or health condition. If you plan to use insurance as payment, we strongly suggest consulting with your provider to discuss if the procedure is covered in part or in full by your current plan. Q: Will my arm lift have a natural result? The longevity of results varies and is dependent on the amount of excess fat, the laxity of the skin and skin type. Typically, you can expect arm lift results to be long lasting, provided you maintain your weight and a healthy lifestyle. Q: What are the risks of an arm lift procedure? As with any surgical procedure, there is a risk of complication related to infection. Some people may wake up from surgery feeling groggy and experience an upset stomach, side effects of the anesthesia that are very temporary. We are happy to explain in detail any of the risks involved prior to your surgery. We carefully review your complete medical history and all medications you are on to prevent any complications associated with your arm lift. Q: Can I have additional procedures in combination with my arm lift to enhance results? Yes, your RTH doctor can recommend additional services that may enhance your desired results, which can include liposuction, VelaShape, CoolSculpting or other body contouring procedures.